Some people like to heat their homes to Sahara-like temperatures, while others prefer a more arctic feel, however the majority of us sit somewhere in between. The whole ‘how hot should my house be’ topic is a bit of a contentious issue, so I will take you through some of the key points and try to give you a better idea of the temperature that might be right for your home. What does the government say about temperature? A recent government study found that in the UK, the average temperature of a home is 17.7°C, whilst the recommended level is 21°C (70°F). This discrepancy in temperatures has been used to show how fuel poverty was preventing people from heating their homes to a comfortable temperature – it is estimated that 2.5m people are currently living in fuel poverty. This is really oversimplified though, because some people will need higher temperatures – like the elderly or ill – whilst the average person can get away with having the temperature much lower. It is a little odd for the government to recommend this relatively high temperature when it is trying to reduce energy consumption. To be honest, the majority of people can live very comfortably at a temperature well below 21°C, so don’t just set the thermostat at this temperature out of habit! Many people use a thermostat to set their temperature, but you need to make sure it is set up correctly. A thermostat works by recording the ambient air temperature around it. If the temperature of the air is lower than the thermostat, it will send a message to the boiler to fire up, while if the temperature of the air is higher, it will tell the heating system to switch off. Therefore, a thermostat positioned right by your draughty front door is going to kick in at a lower temperature than one in your living room. In this case, even though you are setting your thermostat to 21°C by the door, the temperature in the living room might be getting up to 24°C. As a result, it is really important to know your house and how warm you need it, rather than just setting it at a certain level and forgetting about it. You can negate this by using a wireless thermostat that you can place where you like. It’s no good setting your thermostat to save energy if you are inefficient to begin with. You can set your thermostat down at 16°C or 17°C to save money, but if you have no insulation and an old inefficient boiler, you are still going to be spending a fortune, since whatever heat you pump into the home to warm it up, will quickly escape through the walls. If you set the thermostat to 25°C in a poorly insulated house, it might not even get that warm, because the rate of heat loss will be just too high. So increasing the amount of insulation in the loft, on the walls and under the floor is key to being able to heat your home effectively. Don’t forget your windows either; even if double glazing seems too expensive, secondary glazing like Ecoease could be the perfect way to reduce heat loss. Every house will vary, but the generally accepted rule is that for every degree you increase your thermostat, you will be paying an extra £60 a year. This is because your boiler needs to work harder to get the temperature up – if you have electric heating the savings could be even higher. For larger or more inefficient homes, this can be much higher. So bear that in mind when you go to turn up your heating. If you need to be warmer, put on a jumper, or you could try supplementary heating like an infrared heating panel. This boosts the temperature in a room with instant heat, without having to turn up your thermostat for the whole house. It is a bit obvious, but you can keep your thermostat down if you wear warmer clothes. A recent study found that some people set their thermostat to 30°C, whilst many were setting it above 25°C. In a poorly insulated home, this would mean that the heating would just stay on all day, because that temperature will probably never be reached. These people would save hundreds of pounds a year by setting their thermostat to 21°C or below and wearing some thicker clothes. Using only a thermostat means that you could be overheating other rooms in your home. Heating controls are really important. If you have them, use them. If you don’t have them, get them. Thermostatic radiator valves (TRVs) let you control the temperature of each room individually. For example, a bedroom can be comfortable at 16°C (as you’ll be under the covers), whereas a living room might need to be warmer. Traditional TRV’s are simple, usually using a dial between 1-5 to set the rate, and you can pick them up for as little as £12.50, but there are also more high spec options. If you want full control of your heating system then smartphone enabled systems will give you the ability to zone out your house and only use the energy you need. This starter pack from tado provides everything you need to get set up with. It seems simple, but lots of people set their thermostat to 21°C and leave it there, even when they are out at work. Make sure you use your programmer as well, and if you want to control each room while you are out, you can get yourself a remotely controllable tool like a Nest. These gadgets let you control each room’s temperature remotely, even when you are out of the house. The average temperature of homes has increased over the decades. Ever since the advent of central heating, people feel like they should be able to walk around their home in a T-shirt in winter, whereas years ago people would wrap up even in their living room. Whilst there are certain situations where the heating needs to be up high (for instance when there is an elderly or unwell person in a room), you can usually wear a jumper and turn the thermostat down. Do we really need to have the heating up 4 degrees warmer than our parents had it a few decades back? Can there ever be a perfect temperature that you should heat your home to? The best answer as far as we are concerned is – the lowest comfortable temperature. Some people will happily turn down their heating in the bedroom but don’t want to wrap up in their living room, while others will put on jumpers and use an extra high tog duvet. At the end of the day, it’s your money – so decide for yourself what you are comfortable with, but don’t set the thermostat to 21°C simply out of habit! Programmable smart thermostats are only safe to use if you KNOW that your system can handle playing catch up. As a result,your attempt to SAVE money will wind up costing you hundreds in repair bills. I have a Hive in the ‘middle’ of my ground floor and have set up the programmer to switch heating on in the mornings for a couple of hours and again in the evening. I’ve been monitoring the temperature in my house for several years now, and moving an extra temperature recording device around from room to room for a week at a time to understand what’s happening. I have heating set to come on when inside temperature drops below 15 degrees. This has happened around 10 times in the last week, in the early hours or late afternoon before heating comes on automatically. My target temperature on working day mornings is 17 degrees, because I don’t hang around too long. Evenings and weekends it’s set to 19 degrees. If I’m working at the table or watching tv on the sofa, I usually wear two sweaters or a sweater and a fleece jacket and have a blanket over my knees, to make sure I don’t get chilled through. I also quite often wear a fleece at my desk in the office, when I’m surrounded by people in shirtsleeves. I turn the heating up to 20 or occasionally 21 when I have people here for an evening, but I’m too concerned about climate change to keep the house at that temperature all the time. I feel desperately sorry for people in rubbish rented flats and houses that are impossible or unaffordable to warm. Certainly not a ‘load of rubbish’1 This is a very well written article. Tried and tested, This has totally proved accurate having moved into a bungalow recently. It certainly does not come over as a lecture. The article here is based on government guidelines, common sense, and, as we’ve discussed, the ‘lowest comfortable temperature’. We don’t want anyone to freeze, we simply present a discussion of the guidelines while making it clear that any choice should be based first and foremost on your thermal comfort. That’s said, cutting energy is what we do here. Energy prices are rising dramatically and climate change is a global threat growing bigger by the day. We make no apologies for advising people to lower their heating where possible and practical. We currently live in a semi, cavity insulation, double glazed, gas central heating, smart(ish) thermostat in the hall, trv on most radiators. If the hall thermostat reaches temperature first, then the other rooms never reach their trv setting. There are smart wifi thermostats these days, but I don’t see how this would help in fixing that issue. We are retired and so around the home most days, and when we’re out is unpredictable, and not necessarily both out together. I’m thinking the ideal solution would be a smart trv on each radiator, so we can at least reduce the temperature in bedrooms when not necessary, and use the hall thermostat as a simple timer. We also have a gas fire in the lounge which would exclude the thermostat being in that room. However, smart trv on each radiator would need the heating pump to be running continuously during the timed on period, maybe 15 hours per day in winter …. perhaps asking for trouble with life of the pump. Any ideas for an ideal solution appreciated. I have infrared heating but I’m worried that the thermostat has been place too close to the panel. I’ve been doing some research and I’m worried this could throw off the reading and make my entire heating system completely inaccurate! It’s only in the bathroom that I think this is happening in but I’m not sure how to fix it. How can I tell if it’s been placed wrong with ripping out my bathroom wall!!!? Hi Claire! We’d advise getting a portable thermometer and using it to see if it gives off different readings than the thermostat attached. Bear in mind that, as with any form of heating, infrared will heat different parts of the room to different levels, so have a little play around. If you find that there is a huge disparity then you may need to move the thermostat a little further away – try and get it around shoulder height somewhere. Alternatively, you could set up zoned heating controls. This would give you the ability to set different temperatures for different rooms – if the bathroom thermostat is reading a little higher than you think is accurate then you could just turn that room down a little. You can read more about it here: https://www.thegreenage.co.uk/controlling-infrared-heating-panels/. I live in rented accommodation, a converted property into flats with just one boiler so the central heating is purely controlled by the landlord. We are 70 years old and there is black mound around some windows. Clothes in the wardrobes feel damp and I suffer from asthma. Is this legal he can do this? He’s family (cousin)! I found the coverage useful and affirmative of many of the views I had come to have about the weaknesses of the communal heating system serving the block of six flats where I live. Hi Kate, 26C exceeds World Health Organisation safe limits for homes. 23 degrees is the highest for safety, see https://www.ovoenergy.com/guides/energy-guides/average-room-temperature.html I don’t know if there is legislation on this but you can surely find out online. We live in 3 Bed Semi Detached House and we have solid bricks and that means no insulation. When we moved in we removed the old warm air duck system and put Infrared Panels in the entire house as per the calculations done by the provider. As of now I don’t think they are working and giving us all the benifits because in every winter I endup paying £200+ in electricity bill which turning out to be very costly. Just to raise the temp by 2degree I have to keep the infrared panels ON for few hours and sometimes we don’t even acheive 21 degree even if we put them ON for 12+ hours. So not sure what to do? Could you please advise? Shall we put back treditional radiators? or shall we invest on external wall insulation? I’m looking for advise, I privately rent in Bournemouth UK and I have a 7 year old and a 3 year old toddler, we don’t have any heating and rely on 2 night storage heaters and 5 electric heaters! We have been here a year now, and we’re starting to get ice inside the flat it’s terrible and so cold we hardly sleep! I use between £5/£10 electric a day, and I have complained to my letting a agents for the past year, and they haven’t done much, we moved out of our last flat because it had no heating either, this is our second bad flat because I’m a single mum no one will help me. What can I do? stop paying rent till issue is fix. Is this too hot ? Yes as average temp is 21. try turning it down if you not that.cold. It is entirely up to you! 27 is pretty warm! Do you have a thermometer at home? Check what temperature your home gets to – there may well be a discrepancy between air temperature and the thermostat. If that is the case, it will be expensive for you, since the boiler will be running at felt pelt to try to get the house up to the temperature, but heat loss through walls and windows will mean that it reality it can never reach that. It therefore might be better to set it a little lower so your boiler doesn’t need to work so hard. It has been estimated you can save approx £50 per year for every degree you turn down the thermostat. Based on this turning it down to 21 might save you £300 per year. If it is wireless and running off internal batteries then there shouldn’t be a problem with carefully moving it to your living room, where it should be closer to your boiler and may fix the issues. However you must first make sure that you can safely move it. Hi I cant heat my home because the bills are so expensive .It is 13 degrees at the moment. Here in the States (across the pond) in the middle Atlantic states we try to keep it a moderate 68 degrees F in in winter roughly 21 degrees by UK standards.. Having lived in both places and BOSTON.. I have gotten used to wearing sweaters in the Fall. Hi WoodinVirginia, that is the way it should be to be honest. Being able to wear shorts and t-shirt in the middle of winter means that higher energy bills shouldn’t come as a surprise! I notice you haven’t dared to enter the Mr vs Mrs aspect of heating homes….my husband and I have different internal thermostats as far as I can tell. He will regularly edge the temp towards 15degrees! I’m more comfortable at 18/19 degrees. However I have noticed from reading your article that our thermostat is located in the hallway next to the front door- suggesting we actually have no idean what our true temp is running at! Hi Lizzie, we have been in a client’s house when British Gas were installing a boiler + heating controls and they tried to position it next to the front door too. This is the worst place for a thermostat, since it will normally encounter cold draughts when the door opens which in turn will make the boiler fire up. Ideally you want to put it in the lounge, away from draughts to give a more stable heating experience! I think the Mr & Mrs thing we will leave to be honest, although worth mentioning since my girlfriend moved into my house I have noticed the gas bill is creeping up – no idea why!! Hi Nicky, yep – well I guess it means more gas being used! I think that is why a lot of people think they need the thermostat set so high!! 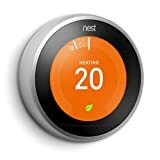 We would always recommend putting the thermostat in a living room and it being far away from the door as well as being a decent distance from any open chimneys. I’m not certain you’re quite right suggesting the thermostat should be in the lounge. It might be best perhaps installed where the temperature remains the most stable – in the hallway. When one thermostat controls the whole of the house, placing it in a room which is prone to temperature increases through people sitting around, appliances on etc may mean the temperature of the lounge may rise quicker than the rest of the house. The result? The thermostat turns off whilst the rest of the house is lower than the target temperature. The hall is best – just not by the door like you mention! We actually recorded the temperatures of the Hall, Kitchen and Living room within the properties of all of us here at TheGreenAge and found that the Hall actually fluctuated the most in temperature (lowest volume of air and an external opening). Therefore the living room is the best place to put it. You don’t live in the Hall, so you don’t really care what temperature it is compared to other rooms, whereas you don’t want the living room to suddenly shoot up to 25 degrees when someone opens the front door. You don’t cook a scone in the oven with a thermostat in the grill, so why would you ever have a comfort controlling room thermostat in a room that you don’t sit in?